It has been in rainy season in this area since last month, so now the activists in Jivaka are no longer suffered from 40 degree heat. Although there is no extremely hot weather anymore, still it is hot, rainy, and humid. so I feel unpleasant these days. After the pouring for a week, town people including the old and young, are busy to transplant rice. They start their work from dawn to dusk. I can forget the heat for a minute thanks to the pouring water but sometimes I face big problems because of it. That’s because more diseases occur in rainy season in Dungeswari where people have poor condition in nutrition and sanitation. There are many trashes with excrements in puddles, wells and waterways in the town. That makes people easily able to get diseases. 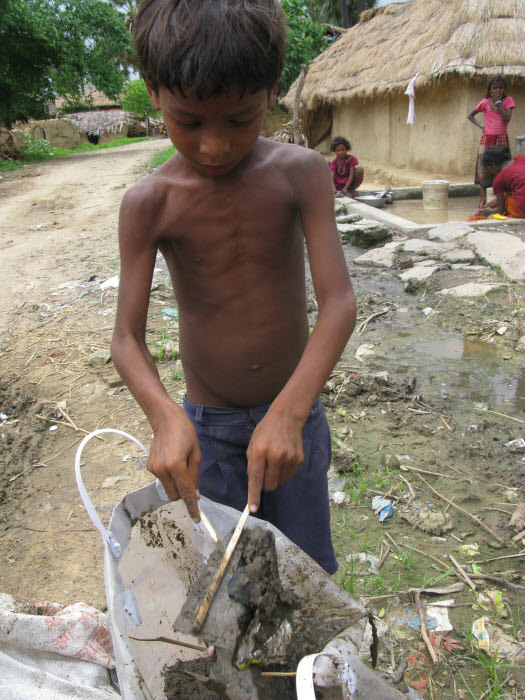 This dirty water goes into the ground and people use underground water most of their time, so it leads older people and children, who have a delicate body, to easily get diarrhea. Small scar on skin often grows into big abscess because of the polluted water as well. JTS hospital has tried to eradicate every disease in town, Cholera was one of them which people normally think as disappeared disease nowadays. Cholera occurs this year again in some areas where have bad sanitation in India however. It is easy to have Cholera treated in Korea, but it is scary killer disease in Dungeswari. Most people in Dungeswari have bad nutrition, so Cholera can kill them causing diarrhea and dehydration after couple of days they got caught. After rainy season begins, several people visited hospital and got treatment and one died, right after arriving at the hospital to get treated. Fortunately, there was no more death but, It took someone’s father, husband, and son in a flash. In order to prevent people from catching Cholera, JTS India, and other Indian staffs decided to fumigate waterway and wells in the town. This year, the rainy season have come late compared to last year, and It made many puddles in the town. The puddles become the source of disease having germs, if the dirty things like trash, excrements were mixed up in the water. Ham ka lange! We clean our town by ourselves! Last saturday every month, JTS Indian staffs, interns, high grade students and Korean activist practiced Shiramdan in Jagdishpur. During Shiramdan we clean every school buildings and playground. This time we decided to clean our town too. We picked up the trashes and sprayed disinfectant on everywhere in town. I was worried at the beginning because there were a few people who practiced Shiramdan for many places to clean up. Thanks to children who guided the places where need to be cleaned, we were able to finish cleaning within a planned time. 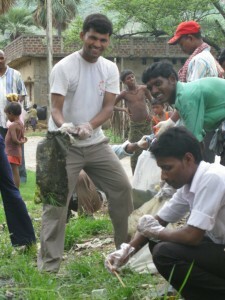 With the mind like ‘Clean up my town with my hands.’ we completed the mission of Shiramdan. It was wonderful time for me to learn lessons, which it takes just small action to save and help the third country people, such as picking up a trash in front of me and not throwing trashes on the street, more than having lots of money and special abilities. I can see the hope in Dungeswari since there has been changes which people try to keep their town clean and make disease away by themselves. It seems that the people, who used to live in garbage pile and bring germs to diseases, are no longer exist. Now I wonder how the town would have changed, when the children fully grow up in the future. 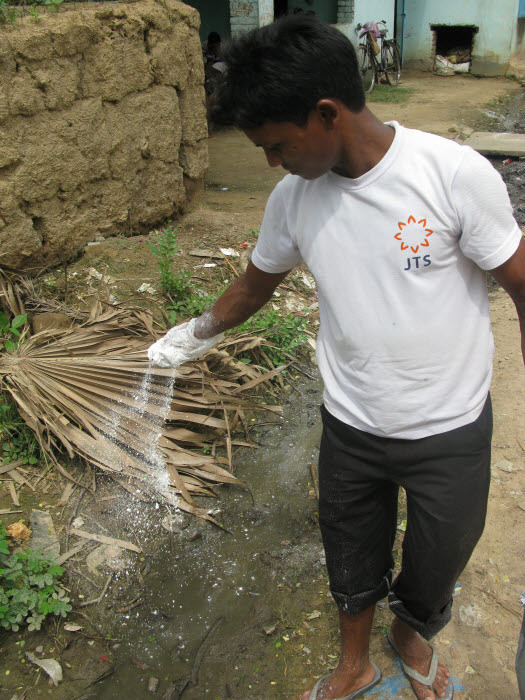 Starting from Jagdishpur, we sprayed disinfectant on places such as wells puddles and waterways and cleaned them up. Even if Cholera disappeared this time, there should be more effort to prevent children from other diseases. It’s raining outside again. I wish the rain drop gives break to the exhausted town people from the heat, and becomes the stream of hope to help plants grow well.